A separate sales channel needs to be added in Brightpearl for each marketplace you list on for each Amazon seller account, i.e. one per seller per marketplace. This means you can report on a site-by-site basis. For each marketplace you get to choose a price list, warehouse, sales order status, channel brand, bank account and fees account. These can be the same or different across each of your marketplaces. However, the price list selected must be the same currency as the marketplace which you are adding. This ensures that the price you see in Brightpearl is what you see on the listing on Amazon and that the order values are converted correctly. It's now possible to tidy up your Channel menu by hiding inactive Amazon channels. 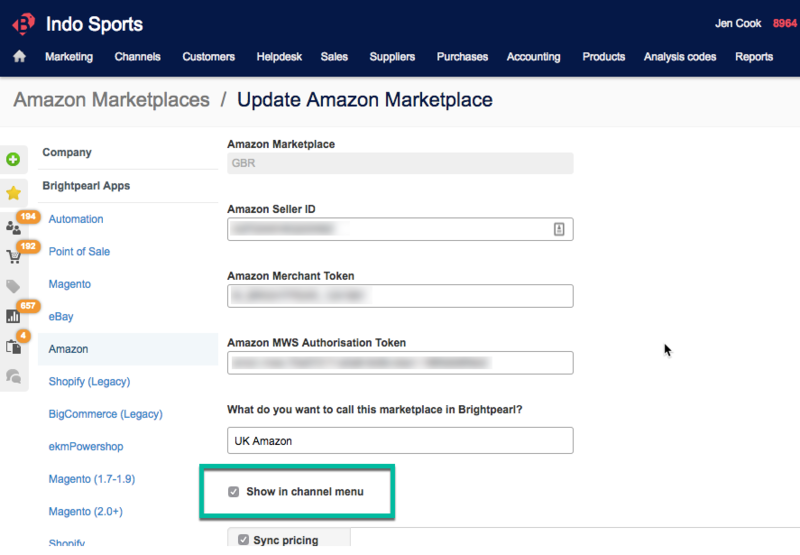 To hide an Amazon channel go to Settings > Brightpearl apps > Amazon, edit the Amazon marketplace and uncheck the "Show in channel menu" box. Choosing to hide an Amazon channel will only remove it from the main channel menu, it won't deactivate the channel. The channel will continue to show in report filters so that any existing data using that channel can still be searched for and reported on.